I think it safe to say that I will forever be indebted to the droid DNA by HTC for delivering to my conscience the Starbucks app. Every time a reward alert comes through, I ask myself: How did I not know about this goodness before now? 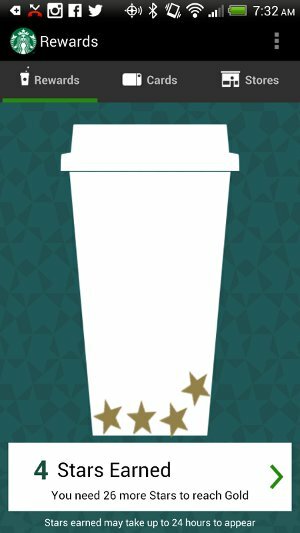 With each little star that bounces into the onscreen cup, I feel like I'm making up for lost time. Ha! But, let me back up. I am an avid Starbucks gift card user, so I randomly searched this app thinking it would be a mere store locator only to find out that I could load my card on the app and simply pay with my DNA. What!? Again ... how had I missed this?? Interestingly, the day after I downloaded it, two people in front of me that morning paid for their drinks with their phones. Your Android phone will display a barcode that you use just like your card to make purchases and allows to check your balance, reload your card with any major credit card, view your transactions and conveniently track your Stars in the My Starbucks Rewards program. And, it's free. Love. I guess I'm now a part of the Starbucks in-crowd. I remember the first time I felt ashamed for not having an android phone - it was when I searched online for the Starbucks app for Blackberry and got nothing but an apology. I'm a Starbucks-head, so that hurt my heart! Can't wait to get my android phone so I can have the Starbucks app! I want to pay with my phone too!